Clerics issue rallying call to Jerusalem Arab residents to come to Temple Mount on Tuesday and oppose expected entry of Jewish MKs. 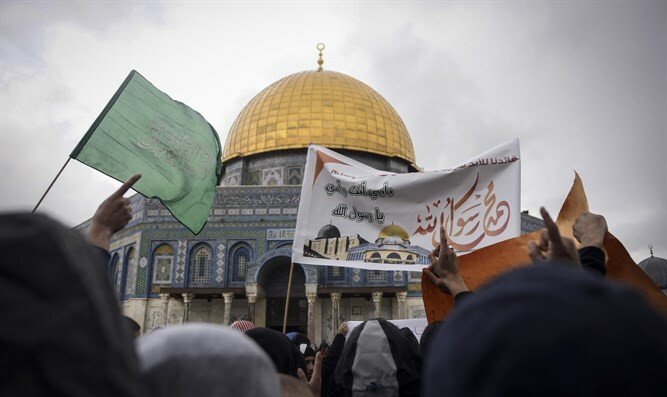 Senior Muslim and Christian clerics in Jerusalem issued a statement attacking the "extreme right" Israeli government for its decision to allow Knesset members to "break into" the Temple Mount compound. In their announcement, the entry of MKs to the Temple Mount was called an "illegal and inhuman step of provocation" which was put into effect by an "irresponsible governmental authority," as "the Al-Aqsa Mosque [sic] belongs only to Muslims." The clerics also noted that the actions taken by Israel would not buy the Jews any rights on the Temple Mount. They called upon the Arab residents of Jerusalem and the “Palestinian people” to adhere to the “right” granted them by Allah to “Palestine, from the Jordan River to the Mediterranean Sea,” and to make efforts to always hold onto the Temple Mount, “especially in two days” on Tuesday, when MKs are expected to be permitted, for this first time in nearly two years, to ascend the Mount during a temporary removal of the government ban prohibiting them from ascending.